It seems that for a very long time this green metal building showed up in my shots of the prairie sky in Clovis, New Mexico. And why not? It was the first thing I saw when stepping out on my front porch. I kind of liked the expression on its face, especially in the second shot, where it seems to be saying "yikes!" 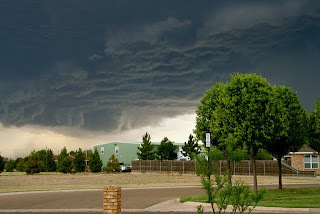 about the incoming weather. Things have changed, now that we are in a very different part of New Mexico. 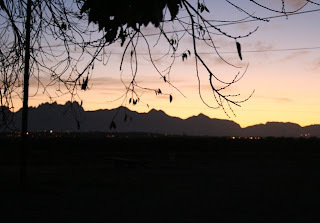 Now I have a choice of views: The Organ Mountains to the east (this is the view from my pillow--mountains, sky, and city lights! ), and Picacho Peak to the west. I like the change, even if my Organ photo is a smeary one--I was so excited to be seeing such a beautiful dawn through that tree branch that I messed up the photo. I'll get better, I promise. Our happy and grateful little family is gathered around the fragrant piñon and mesquite fire that is burning in our kiva fireplace. From our family to you and yours, Happy Thanksgiving! We had our real estate closing last Wednesday afternoon and finally got the keys to the new house. Ever since then we've been pulling boxes and furniture across the lawn from the garage where they were stored when we cleared out the big truck. In between we pretty much just sit outside and look at the mountains and congratulate ourselves on our great good luck. We keep promising ourselves a complete day of rest and I hope today turns out to be it. I plan to do more posting as soon as I can drag myself away from the thrills of unpacking. We finally got our cable/internet hooked up yesterday, so we are no longer feeling so disconnected. I've got lots of photos to share but can't locate the USB cable at the moment. I suppose that means unpacking yet another box. You know how things get when you are moving--we started out so organized, with meticulously labeled boxes. Toward the end there everything seemed to fall apart and chaos set in. In my exhaustion, I labelled a box of baby books and high school yearbooks as "under the kitchen sink stuff." Can't wait to show you my morning walk around the neighborhood! Over the next several days our family will be packing up more boxes, loading them, attending a closing for this Clovis house, driving the boxes and furniture and cats and dogs down to Las Cruces, attending another closing for our "new" adobe home, then unloading the boxes and furniture and cats and dogs. In between, we will be smiling and smiling and trying to rest our backs, because surely people at our age should not be behaving this way! I'll take notes and lots of photos and will be back some time next week to share the experience with you all. 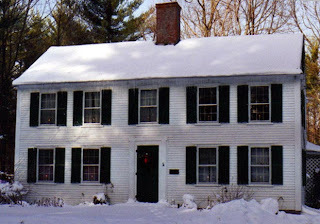 In the meantime, just in case you haven't seen it, you might enjoy reading about another old house we lived in: The House on High Street. 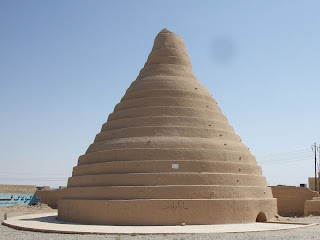 In my search for information about adobe structures around the world, I came across some fascinating information about ancient "refrigerators" in Persia (now Iraq) called "yakhchal." They were being built by 400 B.C. and were used to store food and ice during the blazing desert heat of summer. Circular structures made of mud brick, they often rose as much as 60 feet above a massive interior ice pit. They were arranged so that cooling breezes entered them, and had an exterior groove to allow a continuous trickle of water to spiral down the outside walls, cooling the interior even further. There was a trench around the bottom to capture any meltwater from the ice. This water would freeze during the cold desert nights, then was broken up and transported back down into the ice pits. For more photos, information, and diagrams of yakhchals, see Yakhchal: Ancient Refrigerators. Adobe Homes: Where Can You Find Them? One half of the world's population, approximately 3 billion people on six continents, lives or works in buildings constructed of earth. 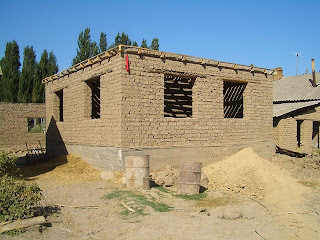 The techniques for this kind of construction may include rammed earth, mud brick or adobe, compressed earth, and cob (a building material that is similar to adobe, and which consists of clay, earth, sand, straw, and water). the same color as the garden soil. A peaceful quiet, held and contained. A strong sense of shelter. 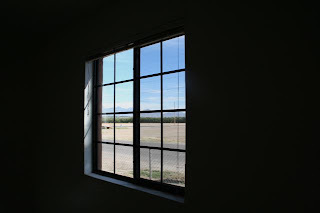 I wrote these words for a post back in 2007 that remembered the little Las Cruces adobe home we owned back in the late 1990s. 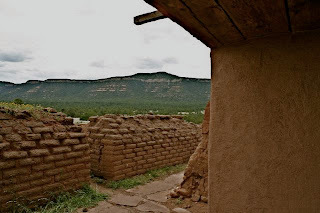 Meant to describe the feeling of living within adobe walls, they will serve as an introduction to some of the terms used for the features of an adobe home. 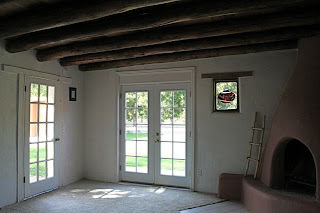 For more photographs of these and other terms pertaining to an adobe home, see the Su Casa Visual Dictionary of Southwestern Style. 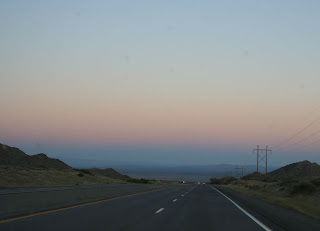 We drove to Las Cruces and back a couple of weekends ago. Unfortunately, we had to do it all in the same day, 4.75 hours each way. We actually had time when we got there to have lunch at Nellie's great restaurant, look at several houses with a realtor, and make an offer on one of them. 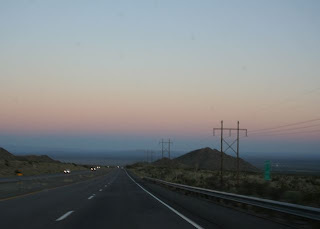 But that meant hours of driving home through the dark, so when we saw these wonderful sunset colors over the Tularosa Basin, there was no time to stop. 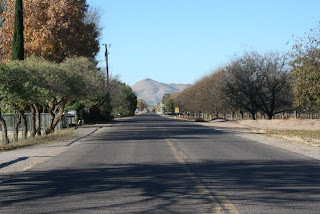 I just snapped away from the moving car, getting these somewhat smeary photos as we emerged from the San Augustin Pass in the Organ Mountains and hurtled on down the highway. I still love the muted colors, though. 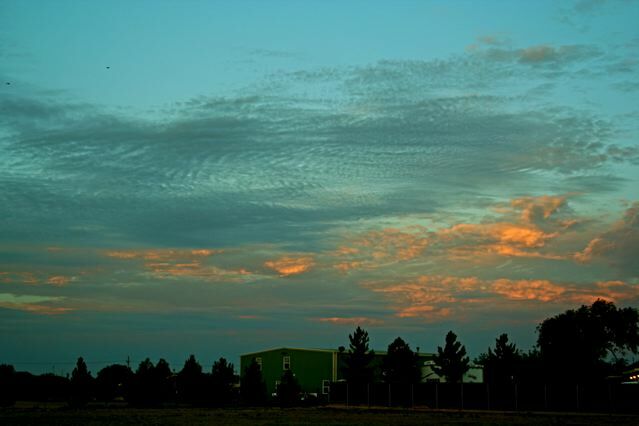 For sky photos from all over the world, taken at all times of the day, please visit Skywatch Friday. It's time for me to learn everything that I can about adobe homes, since we are in the process of buying an historical home made of adobe. It's pretty exciting to think about living in a fairly "green" home, and to realize that it has much in common with simple homes all around the world. 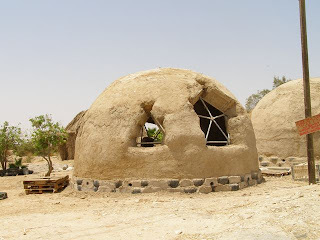 My first search about the history of adobe construction turned up this information, all quoted from The Natural House; A Complete Guide to Healthy, Energy-Efficient, Environmental Homes, by Daniel D. Chiras. Adobe is not the legacy of any one culture. It was the outgrowth of necessity and local availability. 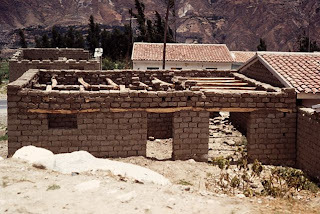 However, despite the fact that adobe building emerged independently in several locations, the techniques and appearance of buildings are remarkably similar. Adobe homes in China, for example, bear an uncanny resemblance to those in the U.S. desert Southwest." If you've been reading this blog for any time, you probably think our family is nuts. We're either moving from one place to another or talking about moving. It's true, we have always been gypsies, but we are coming to the end of all our moving about. It's time to buy a retirement home where we can shelve our collection of maps and atlases and which we can use as a permanent base from which to travel. You've probably also noticed that over the past year or so we've explored a number of places to see if they would fit our needs: Pecos, Estancia, and Cochiti Lake, for example. We even found houses that were for sale that might have worked for us, but as we waited for our Clovis house to sell, we saw those places move off the market, one by one. 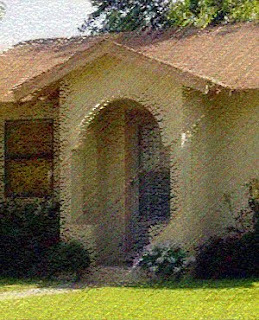 Finally, our own house sold just last week, and we reviewed our possibilities. No one place pleased all the members of the family until we went back to an early choice: Las Cruces, where we have made an offer on an "historical" adobe home that has been accepted. We are hoping that the rest of the real estate doings go smoothly. My next job, in addition to packing up here, is to find out all I can about adobe architecture, this very New Mexican style. Of course, I will share what I find out with you on this blog. 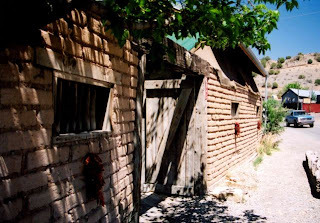 For starters, here is a quote from a book on adobe houses: "No one who does not live in an adobe house can imagine the bond that exists between house and resident. Walking into an adobe is like walking into welcoming arms. This is not just fantasy: adobe walls envelop you with a cool respite on a sweltering day and cozy warmth on a frigid one. 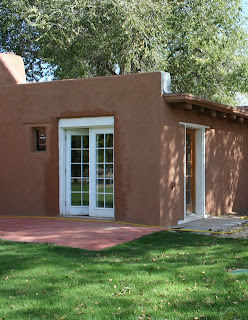 The material itself provides these qualities, but the "look" of an adobe house... is also part of the welcome." 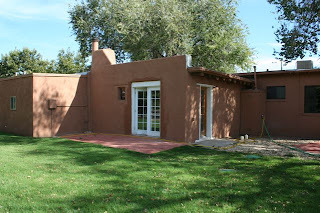 (Reeve: The Small Adobe House). Pretty good for una casa hecha de lodo (a house made of mud).